In the book of Psalms and in other books of the Bible we read of God’s weapons. As children of God and Kingdom citizens this information is in the Bible to help us learn how to pray and stand up to our bullies (demonic forces) in the spiritual realm. As we step into a full expression of our identity in Messiah we will pray in a different way. Instead of us walking in fear regarding the attacks coming against us, if we structure our prayers properly and use the weapons found in the Scriptures, we will see great victory and in fact, the demonic realm will be the ones in fear. Command a massive clearing away of all negative spiritual atmosphere and environment in your life and in the lives of those connected to you. Hail stones – Psalm 18:12 – To damage the property of the enemy release hail. Speak it out – call for it! Locust – Exodus 10:4 – This is a powerful way to shut down what the enemy is seeding against you in the form of negative words. The enemy plants curses over believers, to come against your family, health, business, community, ministry, congregation. The locust of God can devour the fields that the enemy has seeded to bring your defeat. The hook of the Lord – 2 Kings 19:28; Ezekiel 29:4 – God uses the hook to deal with sea serpents – can also be used against serpents like python, leviathan, kundalini. Charge hooks with the Names of God so that when angels put the hooks in, demons are pulled out. Use the hooks to go fishing. God’s net – Ezekiel 12:13, 17:20 – God can use a net to bring something from somewhere to somewhere else. In the spiritual realm this can be used if things try to escape to avoid punishment. Using the net of God in conjunction with other weapons we can inflict punishment on entities that seek to harm us! Instruments of death – Psalm 7:13 – Loose deadly weapons on the powers of darkness. Use this against entities that do not have ordained existence from God. Clones, Holograms, things the enemy has designed, developed and built through technological processes. Confusion – Humiliation – Psalm 35:26, 35:4 – Confusion/Humiliation can be loosed into the enemy’s camp to break down coordinated efforts being made by the powers of darkness. Loose it into local covens and witchcraft cults. Fiery stream/river – Daniel 7:10 – A river of fire flows from God’s Presence – a fiery stream can be released into the camp of darkness and as a wall to guard us. Deep Sleep – Isaiah 29:10 – Command a deep sleep on the camp of the enemy. If the enemy tries to put something (i.e. strife) in your family put the demons to sleep. You can also put portals, wormholes, stargates to sleep. God’s wrath and fury – Ezekiel 22:20-21 – God’s anger and wrath melts. Stars – Judges 5:20 – Stars fought from the heavens. They were created to bring praise and glory to God. Evil rituals have brought them out of their courses, empowering evil agendas through them. We need to restore them to their original state and involve them to serve in the agendas of the Kingdom of God in prayer. 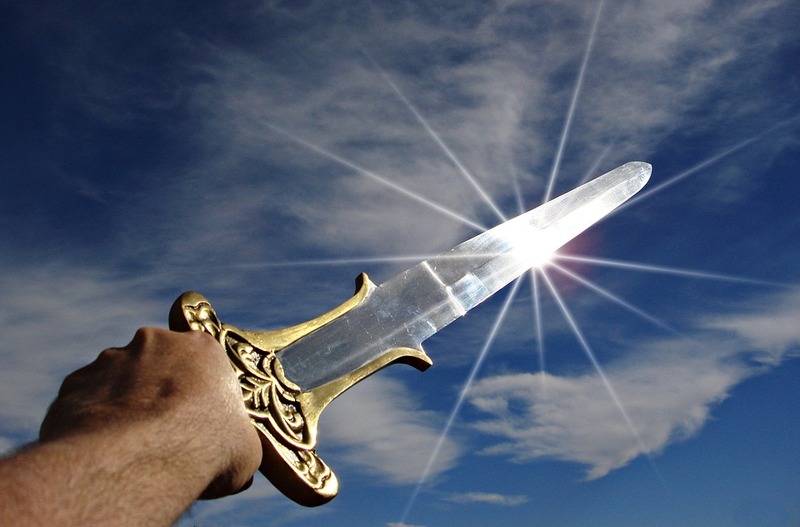 Rod of Iron – Psalm 2:7-9; Revelation 2:27 – Yeshua/Jesus will rule the nations with a rod of iron, shattering them like pottery – call upon this manifestation of His Kingship and power. God is creative. We’re made in His image. Be creative in using His weapons. For example: if you feel darkness encroaching against you, pray a prayer as outlined at the beginning of this teaching, releasing numerous spiritual weapons to just blow everything up that’s coming against you! Let’s move forward in being “doers of the Word and not hearers only” (James 1:22). In doing so we’ll see new levels of authority and power released, and health and victory within the Body of Messiah on earth – for God’s glory and the advancement of His Kingdom on earth, as it is in Heaven!